We are so glad that you have decided to visit our little piece of paradise in Far North Queensland.ï¿½ These notes will help you get there and get organised so you can focus on enjoying the tranquillity and beauty of the area.ï¿½ We hope you will enjoy your stay as much as we always enjoy ours. The region boasts the tallest mountains in Queensland, rainforest, coast, beaches, reef and islands.ï¿½ An easy day trip from Bingil Bay will take you to Dunk Island, Tully River Gorge, Cairns, the Great Barrier Reef and the Atherton Tablelands.ï¿½ Many other islands lie off the coast, including spectacular Hinchinbrook. We have a special hideaway nestled in a few hectares of rainforest, about 500m from a beautiful beach and the Coral Sea.ï¿½ Just to the south of us is the sleepy coastal town of Bingil Bay, which lies at the foot of the rainforest-clad Clump Mountain.ï¿½ From there, a road follows the waters edge, past rocky points, coves and beaches fringed by rainforest to Mission Beach where there is a variety of shops and restaurants (and a great beach of course!). Within easy walking or riding from our place, you will find national parks, swimming at several beautiful beaches and rainforest and coastal walks.ï¿½ Drive around if you must but we suggest that you abandon the car! 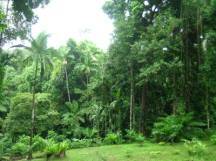 Our place has aï¿½ pole house and a hut that look across a deep gullies and streams to more rainforest that covers the surrounding ridges.ï¿½ It is very secluded and we seem to be miles away from our neighbours.ï¿½ Walks allow you to explore the forest and the creek and also take you over the ridge to the beach. This is World Heritage Wet Tropics and the rich and diverse forest supports an abundance of wildlife.ï¿½ The ï¿½jungleï¿½ noises will remind you of this even if you donï¿½t get to see all the wildlife in whose home you are a guest.ï¿½ It is designated Cassowary habitat, and you will likely get a visit from them on their daily rounds. The hut has a kitchen with refrigerator, and an outdoor hot shower.ï¿½ The house has a well-equipped kitchen, 4 bedrooms, king size beds, 2 bathrooms (one bath), laundry, a number of living areas, and a pool.ï¿½ There are bedding, towels, and a variety of basic cooking ingredients and condiments etc.